Christina M. Spiker is a Visiting Assistant Professor of Art History at St. Catherine University where she teaches courses on global art history and visual culture. While her research primarily focuses on issues of race and visual representation in modern Japan, she enjoys playing a JRPG or two when she isn’t in the classroom. 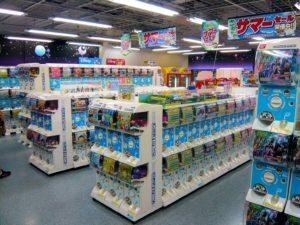 Most players of mobile games intimately understand the economic model of the Japanese “gachapon” (ガチャポン), even if they are not familiar with the term. 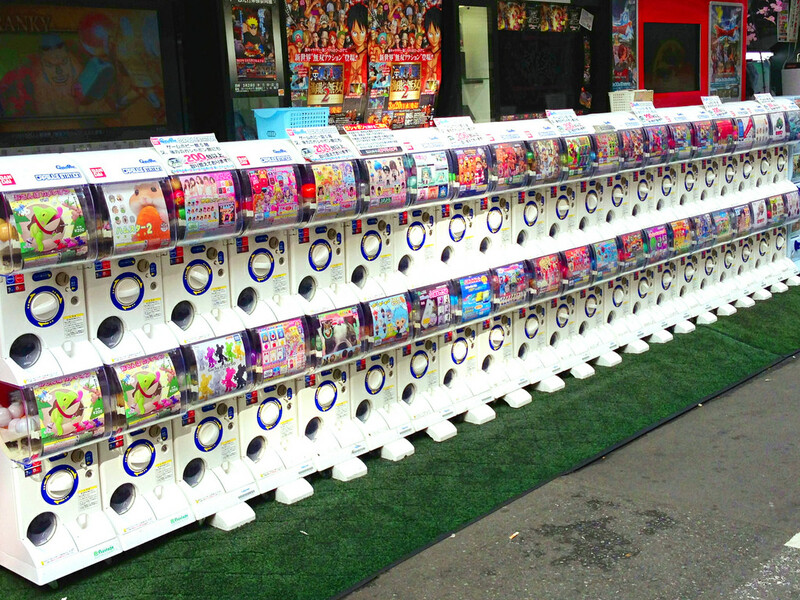 Generally speaking, a “gachapon,” (or gashapon ガシャポン, gacha ガチャ, or gachagacha ガチャガチャ) is a coin-operated toy vending machine. Many of us have likely spent our quarters in similar machines as children, accumulating an eclectic array of bouncy balls, stickers, and other cheap goods in the lobbies of supermarkets around the world. The Japanese term derives from onomatopoeia for two distinct sounds: the “gacha,” or the sound of turning the crank of the machine, followed by the “pon,” or the sound of the toy dropping down into the receptacle. It is a blind process, but the graphic advertisement on the front of the machine allures us with the promise of possible rewards. Unlike other forms of entertainment that award prizes (such as the ubiquitous UFO catcher, better known in my household as the “claw machine”), one does not need any skill to operate a gachapon. Simply drop in your coins, turn the crank, and await the surprise. Gachapon are ubiquitous in Japan, and you can encounter large quantities of them tucked and stacked in far corners of arcades and large electronics stores like BIC Camera. While the word “gachapon” refers to this particular invention, the term has more recently been employed as a method of monetization in mobile gaming. This essay briefly explores the intersections between the history of the machines as socio-cultural objects and the use of gachapon mechanics in virtual play. DocChewbacca, Gashapon Floor – Yodobashi Camera, Shinjuku, 2008. Flickr. Creative Commons BY-SA 2.0. From games with a popular following, like Nintendo’s Fire Emblem Heroes (Nintendo, 2017), to popular mobile games like Puzzle and Dragons (GungHo Online Entertainment, 2012), Sword Art Online: Memory Defrag (BANDAI NAMCO Entertainment, 2016) and Fate/Grand Order (Aniplex Inc., 2017), the gacha mechanic builds casino excitement into the daily grind of mobile play. These games operate according to a logic of resource scarcity, similar to that explored by Bradley J. Fest in the game SimCity Buildit back in November. The “shortage” in these games is created by limited-time events that feature highly desirable, but difficult to obtain, characters or items. A 2014 study of Japanese mobile games shows that limited-time events were found in 90% of the games tested (Shibuya, A., Teramoto, M., & Shoun, 2016). In essence, players chance their in-game resources in the hope of “rolling” their desired outcome, usually with dismally low statistical outcomes (For example, in Fire Emblem Heroes, the chance of acquiring the featured character on any specific “banner” or event is roughly three percent). While there are some players who bargain with real-world currency (called “whales,” a term that comes from the world of casino high-rollers), many free-to-play players need to carefully select a specific event or window during which to expend their accumulated in-game currency. As with most forms of gambling, failure to get the item or character leads to inevitable player disappointment. But on those rare occasions when luck in on your side, you become reenergized to continue the save-and-spend cycle in a delicate balance of risk and reward. The mechanic described above is well worn in today’s mobile games; however, it has cultural and historical roots worth interrogating. After all, the first coin-op vending machine was American, not Japanese. Chewing gum magnate Thomas Adams first developed a machine to dispense sticks of gum in 1888. 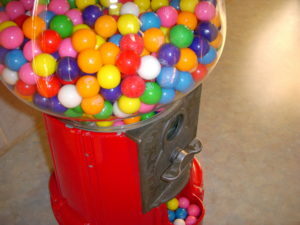 In a bid to make the dispenser more successful, his company rethought the machine’s design and came up with an attractive, shiny metal version in 1907 that dispensed colorful, spherical balls of gum. 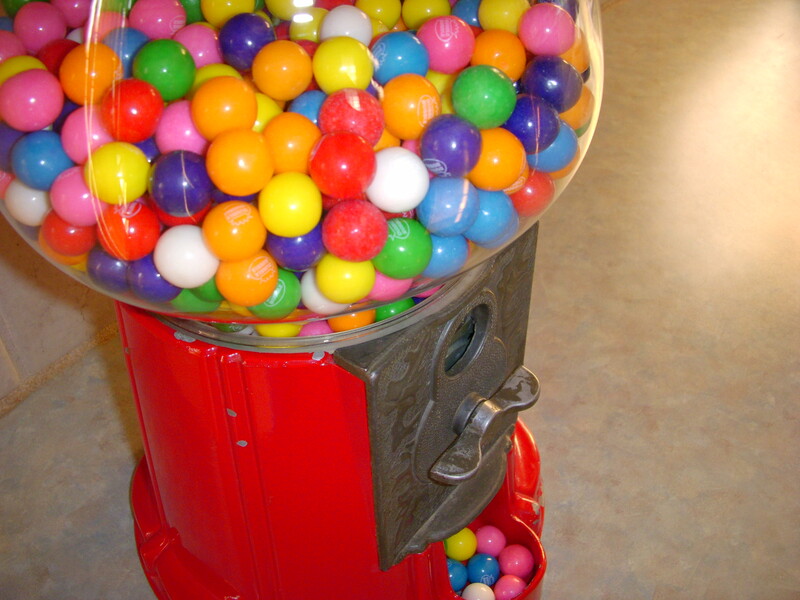 The gumball machine was ubiquitous in the United States by the 1920s and 1930s, and would be exported to Japan alongside movies and fashion during the same time period. Julie Alexander, Vintage Gumball Machine, 2008. Flickr. Creative Commons BY-SA 2.0. After Japan’s defeat in the Second World War, machines selling small imported American toys proliferated during the American occupation. Children of the mid-1960s may recall being able to purchase a toy for roughly 10 yen (Omatsu, 2014). (Today, gachapon cost anywhere between 100 and 500 yen). Capitalizing on its popularity, Japan’s BANDAI Corporation trademarked the “gashapon” machine in 1977. The gachapon rose to popularity during a “leisure boom” in late 1960’s Japan, a period characterized by the resurgence of consumer culture and disposable income in the wake of wartime devastation and rebuilding (Daliot-Bul, 2009). As Japan’s economic miracle flourished through the 1970s and 1980s, play (or asobi) was promoted as both personal growth and socialization (Daliot-Bul, 2009). The collection of toys, including gachapon, was but a small part of cultivating “everyday hedonism.” In his reflection on toy culture in Japan, Michal Daliot-Bul explains that, “toys are bought for aesthetic and emotional purposes rather than for the play that was initially intended by the manufacturers” (2009). Essentially, people collected capsule toys not because they wanted to play with them, but because amassing these collections was a source of personal pride. With this affective response in mind, plastic toys would be marketed to a wide audience ranging from children to adults. When discussing Japan’s postwar growth, scholars–such as art and cultural critic Noi Sawaragi –have come to view the gachapon as more than just toys in plastic capsules, and see them an apt metaphor for Japan’s new postwar reality. Sawagari explains: “War or history have come to be sealed inside the anime or manga world. It is a sterilized, innocent, purified experience, defined by putting everything war-related inside a capsule” (Lubow, 2005). Sawaragi’s statement is strategic in many ways. He is a supporter of contemporary artist Murakami Takashi’s Superflat movement, which argues that Japanese society has become shallow and two-dimensional by sublimating wartime experiences. In Murakami’s model, the trauma of the war finds its purest expression in other “flattened” media such as anime, manga, subculture, and as Sawaragi would have it, gachapon. Andrew Lubow further extrapolates on Sawaragi’s points by pointing to the kawaii (cute) miniaturization of dangerous images, such as war planes and atomic monsters, that, now sanitized, “pop out, one after another, in no particular order” (Lubow, 2005). 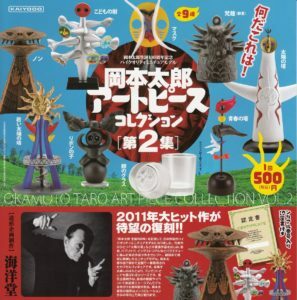 In a sense, today, everything from Godzilla to contemporary art finds its way into randomized colorful plastic capsules. Today, gachapon are usually framed as either a part of anime and manga subculture (Lubow, 2015) or as a mode of monetization in mobile and social gaming (Shibuya, Teramoto, Shoun, 2016). However, I want briefly examine three different ways that virtual gacha intersect with real-world mechanical counterparts and communities. 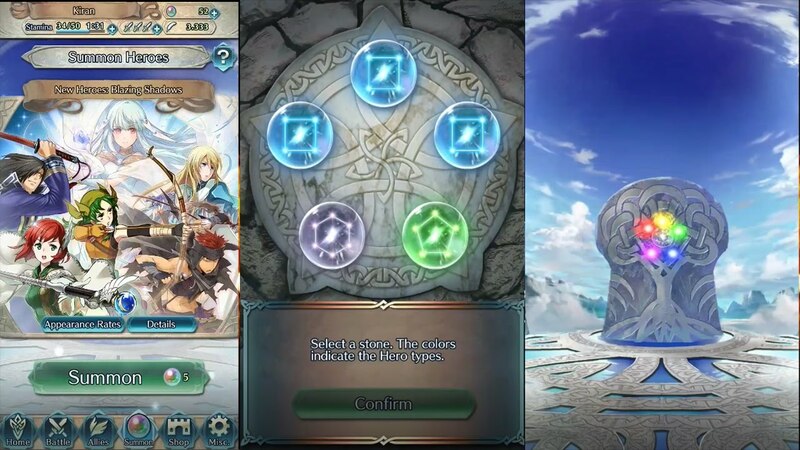 Nintendo’s Fire Emblem Heroes does not use the graphic of an actual gacha in the game, but it adopts the system nonetheless, choosing colorful, shining orbs to imitate the plastic capsules. The virtual gacha system has generated vibrant discourse on sites like Reddit regarding whether or not you should “pull” (or “summon”) on a specific event, a decision that weighs theory-crafting against the desirability of certain items and characters. The virtual “orbs” come at a stiff price in Fire Emblem Heroes (three for $1.99, ten for $5.99, 35 for $19.99, 140 for $74.99, etc.) For this reason, free-to-play users consult these online forums in order to get the best bang out of their accumulated free resources. After all, once spent, it could take several weeks before there are enough resources to summon again. In these spaces, players not only discuss the merits of particular events and characters, but often post screenshots of their “pulls” to relish in their good (or terrible) luck, sharing in the collective elation or frustration. The steep cost of in-game currency makes the game targeted towards “older” players (Nintendo has stated that Fire Emblem Heroes is for players aged thirteen and up). The risk of adolescent overspending in mobile gaming caused the Japanese Consumer Affairs Agency to shut down some of the more aggressive gacha models that required the collection of complete sets, called konpu gacha, in 2012 (De Vere, 2012). Even still, as with any online purchase, it is easier to spend massive amounts on a credit card than manually inserting coins into a machine. By invoking gachapon, known as a cheap form of entertainment popular with children, it downplays the actual financial burden of participation. In addition, unlike the real gacha economy, where toy duplicates can be traded and resold in used stores and online, the online economy doesn’t allow for such aftermarket possibilities. While many mobile apps like Fire Emblem Heroes function through in-app purchases, gachapon also appear in Japanese games that have a more traditional, up-front pay model, such as Yo-Kai Watch (LEVEL-5, Inc., 2013) for the Nintendo 3DS. As with other games like Pokémon that are targeted domestically towards Japanese children, Yo-Kai Watch is also a game about collecting at its core. It features monsters (yo-kai) based in Japanese folklore, which differ from the fantastic and culturally odorless (mukokuseki) quality of Pokémon (Allison, 2003). 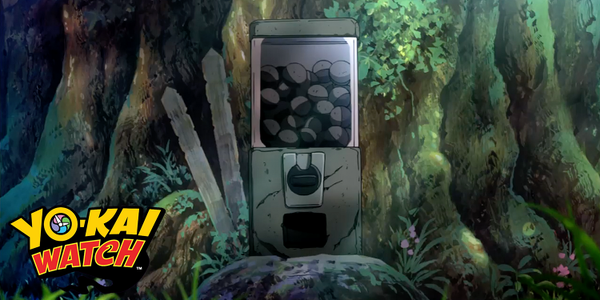 Within the game, an ancient capsule toy machine can be found at the base of a sacred tree and functions as a prison of sorts, merging the game’s narrative, popular consumer culture, and Shinto religious aesthetics. The yo-kai trapped within the Crank-a-Kai can then be released with special coins. Like physical gachapon, the color of each capsule hints at the rarity of the yo-kai contained within it, building mystery and anticipation within a blind process. This is both similar and different from “poké balls,” the spherical “capsules” used to capture Pokémon, as the Crank-a-Kai is mainly facilitating the monster’s liberation (and entry into the player’s collection). The virtual presence of gachapon machines in the world of Yo-Kai Watch presaged the release of actual machines modeled after the Crank-a-Kai in stores all across Japan. 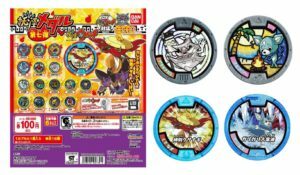 With the rising popularity of the game, fans could take their turn trying to acquire plastic medals featuring specific yo-kai for their physical collection. 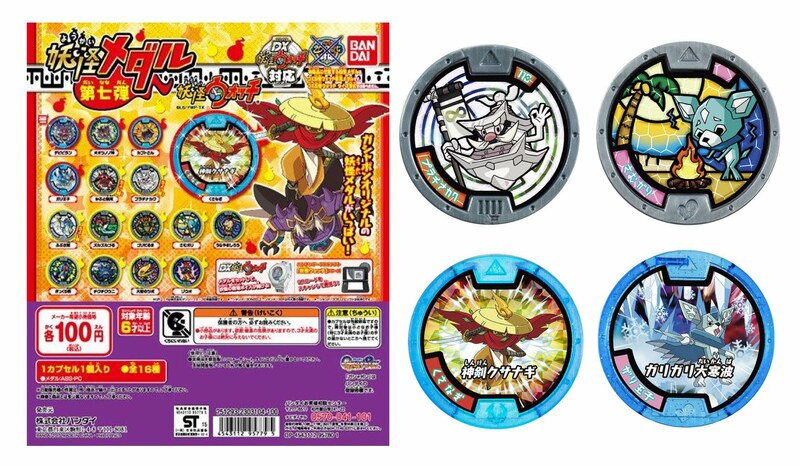 (In the United States, the medals were not released in Crank-a-Kai machines, but unsuccessfully sold as plastic “blind packs” each containing 3 random medals). Yo-Kai Watch was eventually developed into a mobile game (Yo-Kai Watch Wibble Wobble, LEVEL-5 Inc., 2015), which does follow the typical mobile gacha monetization model, but the game’s initial success carefully blended reality and fiction. Using a gachapon in game was a potent way to hook fans into buying even more game merchandise in reality. While gachapon can be seen in games targeted towards teens and adults (Fire Emblem Heroes) or children (Yo-Kai Watch), they also make a conspicuous appearance in Japanese otome games (乙女ゲーム), story-based video games targeted towards a largely female audience. The first otome game on the Super Famicon, Angelique (Koei Japan, 1994), did not contain a gacha system, but new, mobile iterations have wholeheartedly embraced this mechanic in the collection of rare and exclusive avatar items. Shall We Date? is a series of games with wide-ranging themes from Alice in Wonderland to samurai romances developed by Osaka-based NTT Solmare. 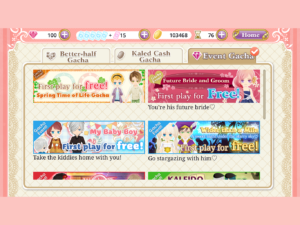 While these games are free to play, one must expend resources to ensure the “perfect ending” to each romance. 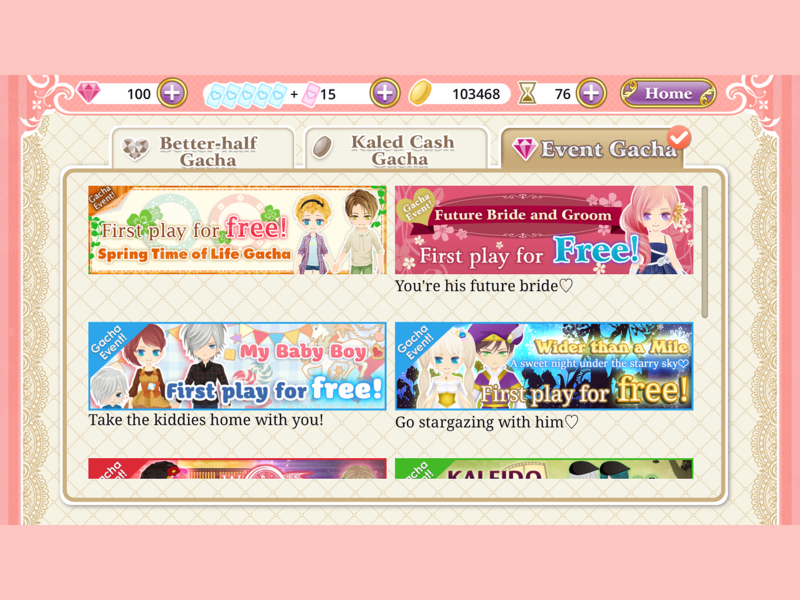 In special gacha events, players can spend resources to roll the dice on featured items from special dresses to unique avatar accessories. The Shall We Date? Love Tangle gacha in action. While playing these games, users need to meet basic checkpoints to ensure the love of their partner, and premium items help you reach these goals faster. In most cases, these items are purely aesthetic as they allow you to dress your avatar in line with your own preferences. This tie to both fashion and romance perhaps emphasizes Daliot-Bul’s point that toys in the capsule economy are often purchased for aesthetic or emotional purposes. Existing only in the world of the game the items in Shall We Date? are not always needed to further the game’s progress, but rather, represent the wants of the user. After all, when the goal of the game is to strategically woo certain characters, who wouldn’t want to look their absolute best? Some otome games also have a limited community aspect, such as a feature that allows you to show off your items to a larger player base, which provides opportunities for connecting (and comparing) with other players (Andlauer, 2017). In this way, they touch on the emotional and aesthetic experience that grounds the pleasure toy collecting. In closing, just as Japanese gacha machines have maintained their popularity from the postwar period until today, the virtual gacha mechanic seems unlikely to disappear from mobile gaming anytime soon. 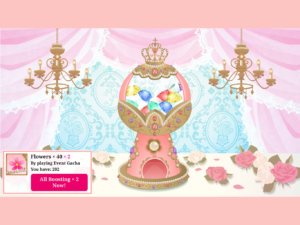 From fantasy heroes, to Japanese creatures, to secret romantic trysts, gacha are used to enhance the player experience through a “safe” form of risk taking combined with the desire to complete collections. While historical gachapon were conceived as a game of chance where money was waged for a physical reward, the virtual economy brings into question the changing nature of play, where the physical items that were so desired in the post-war era are no longer needed for the same affective response. Nevertheless, gachapon in either form seem to cultivate a new sense of everyday hedonism, divorced of post-war necessity. 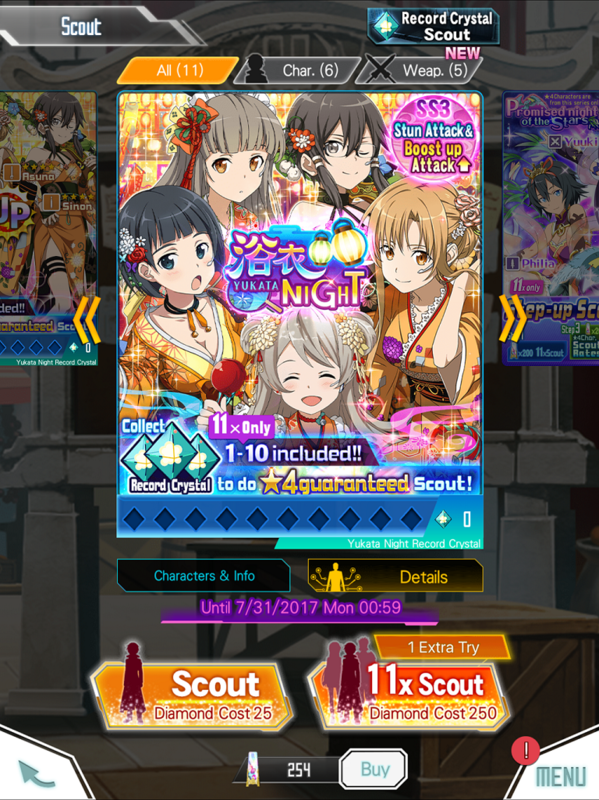 When asked “should you pull?” during the next special event in one of these games, the answer is YES! But don’t be surprised when you fail to get what you want. After all, like gambling, failure is all the more reason to keep playing. Cover photo credit: MsSaraKelly Vending machines outside a games shop in Shinjuku via photopin (license). Allison, A. (2003). Portable monsters and commodity cuteness: Pokémon as Japan’s new global power. Postcolonial Studies, 6(3), 381-395. Daliot-Bul, M. (2009). ASOBI in action: Contesting the cultural meanings and cultural boundaries of play in Tokyo from the 1970s to the present. Cultural Studies, 23(3), 355-380. De Vere, Kathleen. (2012). Japan officially declares lucrative konpu gacha practice illegal in social games. Social Times. Andlauer, L. (2017, May 10). Otome: sens, significations et constructions culturelles. Blog Post. Lubow, A. (2005). THE MURAKAMI METHOD. New York Times Magazine, 48-57, 64, 76, 79. Omatsu. (2014, July 19). Gachagacha/gachapon no rekishi: gachagacha no hasshou ha nijuu seiki Amerika de tanjou (The History of Gachagacha/Gachapon: Its birth in Twentieth Century America). Blog post. Shibuya, A., Teramoto, M., & Shoun, A. (2016). In-Game Purchases and Event Features of Mobile Social Games in Japan. In S. A. Lee & A. Pulos (Eds. ),Transnational Contexts of Development History, Sociality, and Society of Play (East Asian Popular Culture, pp. 95-122). Cham: Springer International Publishing. Vintage Gumball Machines. Collector’s Weekly.